Armed with resumes and a boost of confidence, over 300 students stormed the Multipurpose Hall of INTI International University in a bid to impress around 50 potential employers over a course of two days at the annual INTI Career Fair to enhance their industry experiences and get a head start at the job market. With the likes of BMW, IBM, Ricoh and Sony among others, students had the chance to sit down with the partners to better understand what these employers were looking for in graduates and ways they could secure their placements at these companies. Over 30 INTI students from the Biz Young Investors Club of INTI International University in Nilai were instrumental in successfully carrying out the event which provided INTI students the opportunity to network and mingle with industry players who were there to promote their brands, search for new talents and offer internships and job placements to students and future graduates. “We are excited to have been able to pull this event off. As students, we know how important it is to gain industry experiences before graduating and this is a beneficial platform for our fellow friends to meet employers without having to travel to different locations for job or internship interviews. By bringing people across different industries to our doorsteps, this event ensures that everyone, especially our seniors looking for internship and job placements, are given equal chances and diverse choices made available in one single location,” shared Kenichi Chua, the organizing chairperson of the INTI Career Fair, who is in his second year of INTI’s Bachelor of Business in International Business programme. What started off as a platform for only business students to gain industry exposure has now evolved into a fair for students across various disciplines to meet employers who are searching for interns and full timers across different fields and departments. 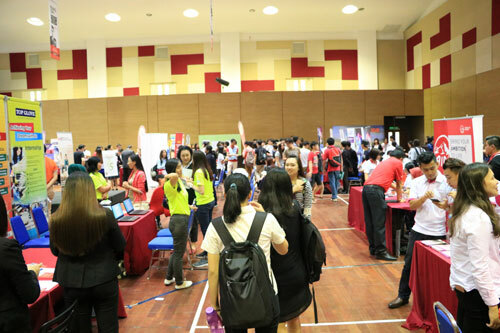 Over 40 companies participated in the two day fair giving them the opportunity to increase brand awareness, scout for young INTI talents and further engage with current students to understand their needs. 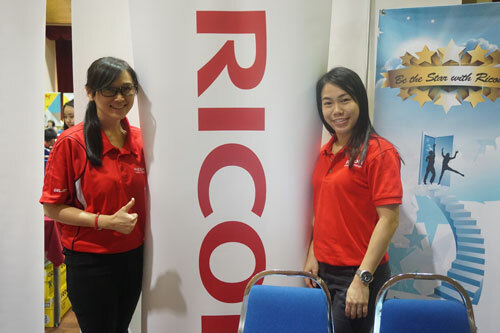 RICOH’s Senior Human Resources Executive, Elizabeth Wong, shared how brand presence was one of their top priorities during the career fair and to give students the opportunity to understand the business landscape at RICOH and search for potential employees and interns. Beyond that, Elizabeth shared how qualities that matter in searching for a graduate go beyond academic. “It’s the way these students present themselves and on top of that, their ability to communicate. I am pleased to say that the students that I’ve met at INTI have been very articulate and they seem to know what they are looking for. I would encourage students to continue to be daring and bold to ask the right questions and always grab the opportunities that come your way without delaying,” shared Elizabeth. While some students were clear in their end goal at the career fair and had preferred partners they were flocking towards for internship and job placements, others were there to meet and network with employers while getting a feel of the job market and expectations. “I believe that being able to meet, interview and interact with the candidate is more important than simply relying on a resume. Although the resume is the first stage to the employment process, meeting the students face to face allows us to learn and discover more about the individual. 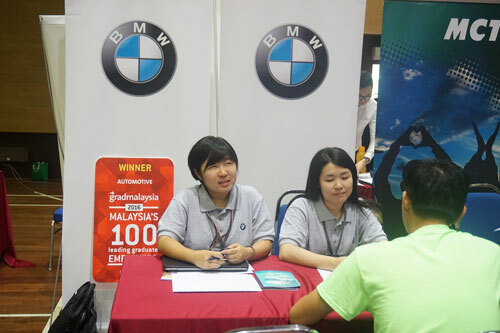 A two way process, the gesture also provides us insight to their character and personality as well as enables them to also demonstrate their knowledge and understanding of our company and the brands we represent.” said Yeow XiaoQian, Group HR Executive of BMW Group Malaysia. “We are proud of our students from Biz Young Investors Club for having successfully carried out the Career Fair with little guidance from the Career Services team. They successfully created a marketplace environment for employers and potential employees and we have received such good feedback from our partners, some of whom are looking forward to the next fair. This was a great learning curve for the students especially in developing their soft skills and broadening their experiences in event management and dealing with partners across different sectors and industries,” shared Rahula Weladavi Acharige, the Career Services Manager of INTI International University. INTI continuously provides its students with endless opportunities to engage in industry-focused initiatives such as workshops, mentorship programmes and employer projects which are driven by the Career Services team. Understanding the importance of graduate employability as the end goal for its students, INTI works alongside over 400 industry partners to give INTI students insights and experiences needed to be industry ready and meet the growing demands of today’s employers. INTI’s strong industry linkage has resulted in 98% of INTI graduates being employed within six months of graduation with 82% earning incomes higher than the market average and 25% of graduates receiving job offers even before they graduate.